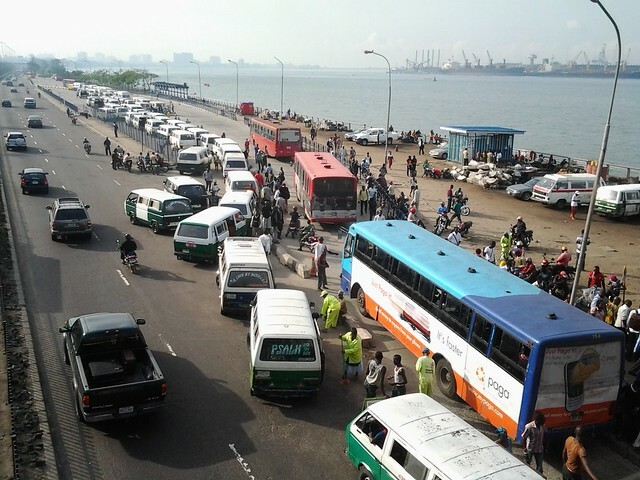 Traffic in Lagos, Nigeria with separate BRT lane. Photo Credit: Flickr/Bankole Oluwafemi. During winter break of my senior year, I spent several weeks at home in Lagos doing fieldwork for my thesis on the challenges and opportunities in the waste management sector. Most of the time, I relied on public transportation to get around. From my base in Sururele, I often took a combination of keke NAPEP (auto rickshaw), danfo (minibus) and okada (commercial motorcycle), in that order, to reach Dustbin Estate and Olusosun Dump, two of my primary study sites. My regular three-stage commutes taxed my wherewithal and patience, especially when traffic occasionally caused journey times to exceed three hours. It also took immense presence of mind and uncanny negotiation skills to get a danfo conductor or okada cyclists to fill out receipts so I could get reimbursed for these expenses. Although it was easier to get taxi drivers to fill out a receipt for those journeys, my research grant from Amherst was limited and transportation costs already accounted for the most expensive line item in my budget. I ultimately resorted to using the Lagos Bus Rapid Transit (BRT) network as much as possible during these commutes and I rapidly accumulated a fat stack of BRT ticket stubs to present for reimbursement. This is how, I became interested in BRT systems and how they have been implemented in African contexts. The shift towards BRT is part of a larger global movement to improve mobility within cities. In March 2008, Lagos introduced the first Bus Rapid Transit (BRT) system in Africa modeled on its South American counterparts like Curitiba, Bogota and Santiago. Cape Town and Johannesburg also have their own BRT networks and the Dar Rapid Transit (DART) system, which I have discussed in a previous post, is scheduled for completion in 2015. 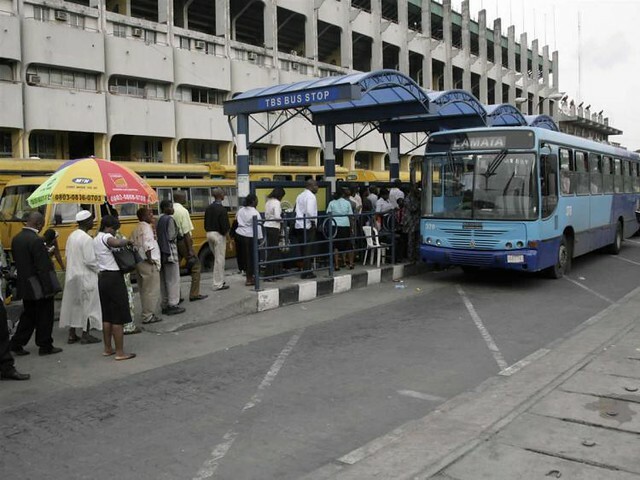 How has Lagos BRT been implemented? As it reduces traffic congestion and offers alternative transport choices for all commuters, the BRT network forms part of the Lagos Strategic Transport Master Plan, which was developed in 2006 to deliver an integrated public transit system within two decades. To cut journey times from mainland suburbs to the central business district on Lagos Island, the Lagos Metropolitan Transport Authority (LAMATA) dedicated a special lane for BRT buses along 65% of the route on the Mile 12-CMS corridor. According to UN HABITAT, the World Bank granted LAMATA $100 million for Lagos’ BRT while the Lagos State Government contributed $35 million. This “BRT-Lite” pilot scheme was constructed at the relatively low cost of $1.7 million per kilometer (compared to Bogota’s TransMilenio which amounts to about $6 million per kilometer). The network has since been expanded to include classic BRT along some routes, where buses will run in a median lane without interference from other traffic. Since its implementation in 2008, the Lagos BRT already has a daily ridership of 200,000 and captures 25% of commuters along the Mile 12-CMS corridor despite accounting for only 4% of vehicle traffic within that corridor. Furthermore, it offers high frequency trips with an average wait time of 10-15 minutes. For comparison, the average wait time for a danfo along the BRT corridor is 45 minutes. The average commute also lasts 40 minutes with fewer transfers required than taking a danfo. In addition to strong political support for the system, Lagos BRT has also generated widespread public acceptance and received relatively high levels of ridership. How did it achieve these targets? Because of the stakeholder consultation and community engagement processes that occurred prior to and during implementation of the system. Crowds wait in line to board BRT. Photo Credit: e-Purse Systems Limited. At the outset, LAMATA involved the state chapter of the National Union of Road Transport Workers (NURTW) in planning the BRT scheme. In fact, Lagos BRT is run as a public-private partnership with route concessions granted to two operators: LAGBUS, a state-owned asset management company and the First BRT Cooperative Society, which is composed of members of the same road transport workers’ union operating on the BRT corridors. LAMATA is responsible for the day-to-day operations of the BRT system. They issue licenses and control traffic systems management within the corridor, bus depot and passenger terminals. Meanwhile the concessionaires are required to procure and maintain the bus fleet. For example, the First BRT Cooperative Society leases about 120 buses from LAGBUS. This multi-stakeholder arrangement reveals the high level of coordination between LAMATA, the state government and private operators. Furthermore, drivers of large buses already plying the BRT corridors were encouraged to retrain to become BRT pilots. Compared to the Dar es Salaam BRT proposal, which relegated daladalas (mini-buses) to providing feeder services and would eventually reroute them out of operation, union involvement and participation in planning tempered the threat of displacement faced by existing bus operators. Since danfos have been limited to using only the service lanes along the BRT corridor, they have adapted to the scheme by specializing in short-distance journeys along the corridors. Correspondingly, BRT fares are on average lower than other travel options as the scheme offers a flat rate on end-to-end journeys. This addresses equity concerns, and makes Lagos’ BRT relatively affordable. On the community engagement front, LAMATA was very proactive in consulting with commuters during the implementation of the Lagos BRT. In addition to a well-coordinated public education campaign in print and electronic media, the agency also relied on third party advocacy. Opinion leaders such as local government chairmen, local chiefs and community leaders endorsed the scheme and communicated its benefits to their constituents. These interactions and endorsements helped to foster a sense of local ownership for the BRT system among Lagosians. Despite the widespread public acceptance of the BRT system, a persistent challenge is the inability to satisfy transit demand at peak periods due to limited capacity. Most commuters must transfer from another form of public transit to access the BRT. To address this last mile issue, the current administration in Lagos under Gov. Babatunde Fashola is developing other areas of infrastructural investment in public transit, including Eko Rail, Lagos Ferry and Lagos Cable Car. Meanwhile, several road corridors are also being upgraded, including Lekki-Epe, Mile 12-Ikorodu and Lagos-Badagry, amounting to a total of 225 ongoing road projects. Despite increased ridership on public transit networks, recent studies show that mass transit schemes like BRT systems and light rail networks do not necessarily cut down on overall car traffic because there is relatively high demand for road space. Furthermore, they might only be successful if the city combines these expanded transit options with other initiatives like congestion pricing to discourage the use of cars and a shift towards denser, mixed-use development. Thus, it is encouraging that Eko Rail will offer through-tickets for BRT buses and promote development along rail corridors. Ultimately, the multimodal transport approach in Lagos holds great promise for the city’s commuters. The integration between road, rail and inland waterway transport solutions offers Lagosians a greater variety of public transit options and will improve the quality of life and the ease of doing business in Lagos. For example, referring to the spare capacity of Lagos’ waterways, Kunle Adeyemi, architect and designer of the Makoko Floating School, suggests that water transport can be utilized for rapid transit since about a fifth of the city consists of water in the form of lagoons, creek and the Atlantic Ocean. Moreover, Eko Rail has the capacity to capture up to seven times as many passengers daily as the BRT system. These reflections suggests that there is still significant potential to reduce vehicle use and improve mobility in Lagos. Post by Kasope Aleshinloye. He can be reached on twitter @ohkasope.